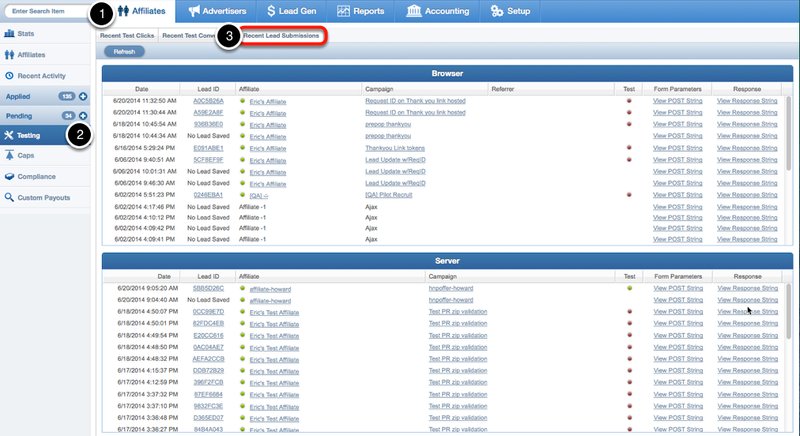 The best place to locate leads for troubleshooting is in the testing tabs which are located in two places. Under the Advertiser & Affiliates main tabs > Testing sub tab > Recent Lead Submissions. This view is broken up into 2 windows - the 30 most recent server and browser posts. This view has no filters as it's designed to display a very limited amount of information. But if you are testing a lead source and don't immediately see that source in your reporting, this is where you should be able to find that lead. It is also the only section that will display rejected leads (particularly duplicates - leads that CAKE rejects on the grounds of having another lead with duplicate lead data) and this data will only display for a short duration of time depending on how quickly leads are being received as it will rotate through. The scrub queue is designed to house unwanted leads, such as host-n-post failures, expired leads, and leads thrown out due to validation failures. It's our trash can for unsellable leads. To access the scrub queue click on the Lead Gen tab > Scrub Queue sub tab. Since these are leads that failed to be accepted or sell, the status column will indicate why these leads are designated unqualified. The review queue is one of two holding places for leads - specifically leads that you want to review prior to attempting to sell them. Leads can be sent here automatically for new sources if you simply want to review the leads for quality or for other reasons including not meeting filters or once a lead has met its cap and can no longer actively sell. To access the review queue, click on the Lead Gen tab > Review Queue sub tab. There's no automated way to move leads from the review queue and the understanding for leads that are sent here is that an admin user will approve or reject them from this queue so there are a couple things to consider when opting to leverage the review queue. First, will someone actually monitor the review queue leads? If resources are tight, then this may not the optimal tool for you. Since we're not outright rejecting them, leads that are sent here are initially paid to the affiliate. There are additional settings (Settings > Lead Gen Settings) that you can leverage to ensure that if and when leads are rejected from the review queue, affiliate payment is removed. The queue is the second and primary holding places for leads where all hosted leads that do not immediately find a Buyer stay. From this queue, CAKE will continue to attempt to sell leads at any recognized opportunity until a lead has been determined to be too old to sell. To access the Queue, click on the Lead Gen tab > Queue sub tab. How often does CAKE try to resell leads? Whenever CAKE recognizes that a condition has changed - a Buyer credit limit has been raised, caps adjusted, delivery methods changed, responses modified, a new Buyer has been added, etc. CAKE does scan the list of leads in this queue hourly and the more leads that accumulate here, the harder CAKE struggles to go through them all and it is best practice to keep this queue within 5000 leads or so. In order to maintain that level, the most effective tool is the vertical expiration hours which are set to 30 days by default but can be shortened based on how long you really want to hold a lead from time of receipt. This report shows all leads successfully received from affiliates regardless of whether they sold or if they have not yet sold, which queue they're housed in. In order to locate leads more efficiently, this report includes custom views including filters for: date and date range, affiliate, offer, affiliate and/or advertiser manager and lead tiers if you are using that feature. This report shows all leads that have successfully been sold to Buyers. For this reason, the number of leads shown in this report may not match the number shown in the Leads by Affiliate report as leads can be sold to multiple Buyers (which would be reported as 1 line per Buyer sold to) and leads can sell on dates after the lead was received. In order to locate leads more efficiently, this report includes custom views including filters for: date and date range, verticals, buyers, buyer contracts and tests.